Why do we play so many games at Brooklyn Music Factory? Kids hopping from one poly spot to another. Koosh balls being thrown at a happy face or a sad face. Chord dice being rolled on the floor. If you walked into a Brooklyn Music Factory classroom, it is highly likely that you might see anyone of the above activities happening. Could be in a band class or a private guitar lesson. 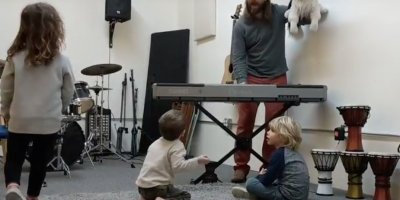 And if this seems a bit different than the piano lesson you took as a kid, it’s because it is. In fact, our curriculum will probably feel radically different. The simplest reason we play games in our music classes is because they work. We have played games with thousands of kids over the last decade and they are incredibly effective at teaching the concepts we believe are essential for our students to learn or to play in a band. We call game play deceptive learning and it remains the most effective tool we have found, especially for ages 4-11. The second part of the WHY is that fun is highly motivating. Kids really want one thing from music in the beginning and that is to have fun. (And ideally have fun with other kids!) Music lessons are NOT about getting good at an instrument for kids, at least not in the first handful of years. The instrument only acts as the ticket to having more fun. Did you say “BLAM” Game? Yep. Big Lessons About Music Games. That’s what it stands for. And what exactly is a BIG lesson you ask? It is any lesson that teaches your child to develop focused and strong listening skills OR any lesson that teaches your child the building blocks of songwriting & composition, otherwise known as music theory. Musicians are athletes. And like athletes, they need both great body awareness (developing fine motors skills) as well as a sharp mind (knowing what to do with those fine motor skills under extreme conditions). 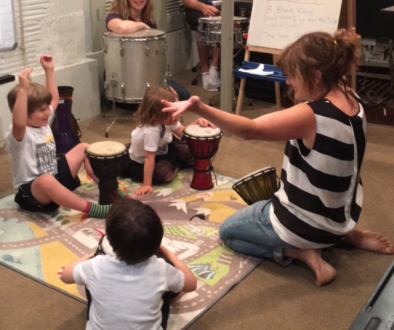 At Brooklyn Music Factory, we break the mind practice into two types of games in our music classes: ear strengthening and theory strengthening. 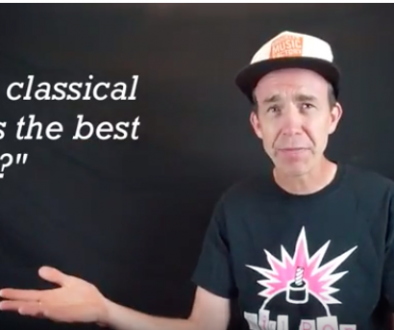 And the body practice, while not simple execution, is much simpler to understand, this is what most people think of when they think of musicians, this is technique on the instrument.